June 19, 2014 – A new exhibition marking the 1200th anniversary of the death of Charlemagne, ‘beacon, king and father of Europe’ has opened in the Octagon Gallery of the Fitzwilliam Museum, Cambridge (UK). Building an Empire: Money, trade and power in the age of Charlemagne displays a selection of the finest medieval coins from the Museum’s own collection (Frankish, Anglo-Saxon, Viking, Byzantine and Islamic) to illustrate the complex political, economic and cultural ties of the period. Charlemagne (768-814). 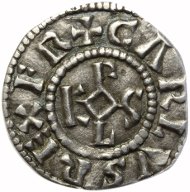 Silver denier, minted at Bourges. © The Fitzwilliam Museum, Cambridge. In Charlemagne’s long reign as king and later emperor of the Franks (768-814) large parts of continental Europe were unified; from Brittany in northwest France to Denmark, Rome, Barcelona and what is now Hungary. In monasteries across Europe there was a revival in learning, and influential new ideas about how kings should rule over their subjects were established. The monetary system was one of the most important aspects of this huge new realm as it was one of the few unifying features. 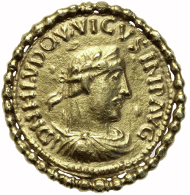 A traveller going from one end of the empire to the other could expect the same silver coins, stamped with the emperor’s name and title, to be accepted wherever he went. As such, coinage was important for enforcing royal authority: more people would see coins than would ever witness a royal coronation or read a royal charter. Louis the Pious (814-40). Gold solidus later mounted with beaded gold border. © The Fitzwilliam Museum, Cambridge. Money was also already an international language and a means of impressing cultural identity and power across the known world. Charlemagne’s neighbours had their own distinct monetary systems. As there were many similarities between the financial systems of England and Francia, rulers in both areas were all the more eager to assert their differences in their coinage. Vikings to the north rarely made their own coins, instead relying largely on pieces of hack-silver measured by weight. To the south and east of the Frankish Empire lay other major empires with a long, rich and quite separate tradition of coinage: Byzantium, the east Roman Empire; the Muslim kingdom of Umayyad Spain; and the Abbasid Caliphate, a vast Muslim power stretching from North Africa to Afghanistan. The exhibition ‘Building an Empire: Money, trade and power in the age of Charlemagne’ is on display from 3 June 2014 to 3 August 2014. Admission is free. For more information and to prepare your visit to the Fitzwilliam go to the museum’s website. If you want to learn more abouth Charlemagne importance to Switzerland, take a look at this article on a recent exhibition in Zurich. And in this article you can get an idea of what a wonderful institution the Fitzwilliam is.